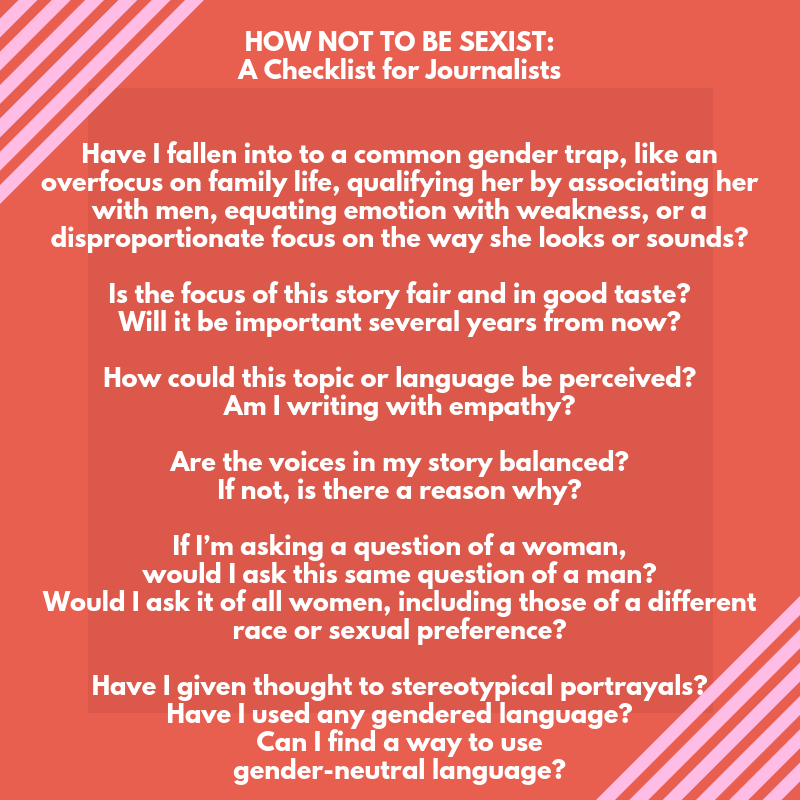 Journalistic guidelines for how to discuss women in the public arena do not yet exist. But my research shows they’re needed. Here is what I propose. Have I fallen susceptible to a common gender trap? Is the focus of this story fair and in good taste? Is it going to be important several years from now? When choosing a topic or a focus, it’s important to consider: Journalists are the ones writing the history books. This gives journalists a responsibility to always make sure they’re covering the most significant and impactful happening at any event. Amy Kovac-Ashley, director of newsroom learning at the American Press Institute, echoes this call for thoughtfulness when choosing a story’s focus. How could this topic or my language be perceived? Am I writing with empathy? Journalists must put themselves in their readers’ shoes: Would they consider this portrayal fair? “For some writers, there is a lack of thinking about both sides as the creator of the content and the consumer of the content, which can lead to misrepresentation or oversight,” says Ashley McCallum, a local reporter at the Janesville Gazette. Pay specific mind to physical descriptions of female characters. Are the voices in my story balanced? If not, is there a particular reason why? Sue Bullard, professor of journalism at the University of Nebraska-Lincoln, also calls for balance of voices and perspectives. If I’m asking a question of a woman, would I ask this same question of a man? Intersectionality: If I’m asking this question of a woman, would I ask it of all women, including those of a different race or sexual preference? Have I given thought to stereotypical portrayals? Portray individuals as closely hued to who they are as possible, paying specific mind to stereotypes. Consider the origin of thoughts. Consider sources as complex individuals, full of nuance and life experiences. No one person is the same. “We have to resist the urge to extrapolate or create a group persona based on an individual that we hear,” says Kovac-Ashley. Have I used any gendered language? Can I find a way to add more gender-neutral language? When using gendered language, like “you guys” or “mailman,” journalists runs the risk of alienating half their audience. “How can you become more inclusive?” asks Kovac-Ashley. For starters, she says, use the correct pronouns. “When you’re talking about binary gender issues, there are people who are trying really hard to use the correct pronouns, and you’ve seen more of that in news stories now than you have in the past, with people starting to ask questions like, ‘Which pronouns do you prefer?’” she says. Examine and question the demographics of your individual newsroom. Adding more diverse voices in the newsroom will have a ripple effect on the language coming out of that same newsroom. “More women need to be represented in newsrooms and particularly in the top ranks of newsrooms. When I became the editor of a small newspaper in Michigan in the early 1980s, I was the first female to do so. But things haven’t changed all that much since. Even though the majority of journalism students are women, that’s not reflected in newsrooms,” she says. Understand the demographics of your community. Journalists must work to ensure that the voices in a story are representative of their community. Think about this stuff before a bad example happens. “It’s harder to be retroactive than it is to be proactive,” says McCallum.